John Migliori caught his first trout of the season Monday at Melville Pond, Portsmouth on his first cast and then went on to limit out using a spinner bait. Trout fishing is still very good and less crowded. 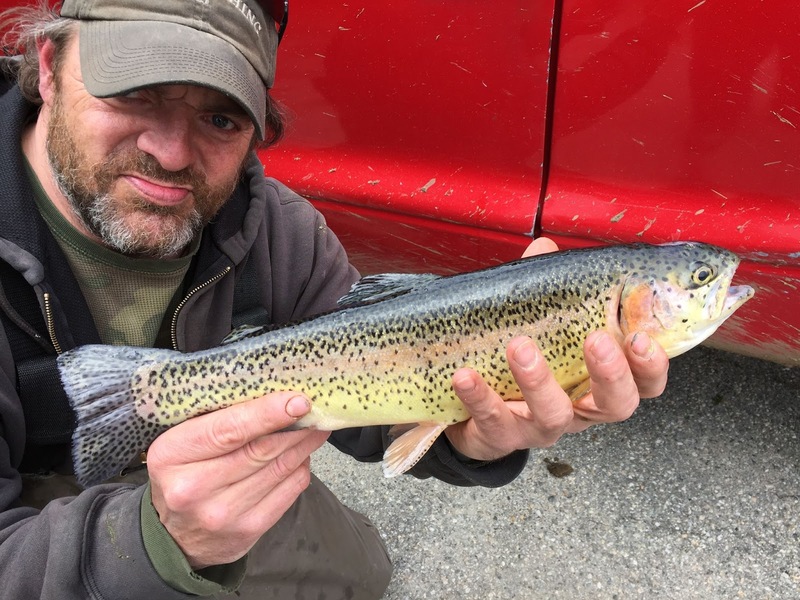 Slow retrieve worked: At 2:00 p.m. on opening day Tim Jacobs of Richmond had little trouble reeling in rainbow trout using a trout spinner bait with a slow retrieve. Jason Howell of Narragansett hooked up with school striped bass at Narrow River. Steve Brustein of Portland, Maine with a spring tautog he caught last year in Narragansett Bay. The spring tautog season opened April 15 and runs through May 31 with a three fish/person/day limit and a ten fish per boat limit (does not apply to charter boats). Tautog fishing is fun and there’s a certain knack to it as it takes a lot of concentration and a quick hook set. 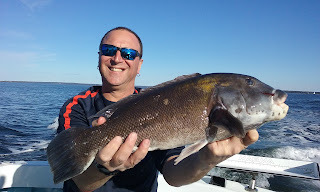 Here are some of my favorite tautog fishing tips I’ve learned from the experts. · Be prepared to fish different types of rigs and bait presentations depending on conditions and what fish want i.e. jigs with bait, green crabs as bait, Asian crabs, conventional rigs, etc. Deepwater Wind, developer of the Block Island Wind Farm, is looking for at least two Rhode Island fishermen to serve as independent representatives of the local fishing fleet in connection with the development of the South Fork Wind Farm at Cox’s Ledge. The independent fishing representatives from both the commercial and recreational sectors will help disseminate information to the fishing community and help facilitate communication between fishermen and Deepwater Wind. They will also serve as the primary point of contact for any area fishermen with questions or concerns about the offshore wind farm or transmission cable. This is a great opportunity for those active in commercial or recreational fishing as these representatives will serve as an important link between Deepwater Wind and the fishing community. Interested fishermen with home ports at Point Judith or elsewhere in Rhode Island should visit www.dwwind.com/fishing-reps for more information. The 7th annual Schwartz Center/Meeting Street Fishing for a Cause Tournament to raise money for students with special needs is now registering fishing participants and dinner guests for their June 23rd and 24th fundraiser. Fishing for a Cause has raised more than $800,000 in its history. “The incredible success of this tournament is due to the increase of corporate groups over the past seven years,” said John M. Kelly, President of Meeting Street. For more information about this year’s event or to donate your vessel and services visit http://www.meetingstreet.org/FFAC or contact Beatriz Oliveira at The Schwartz Center 508-742-6425. Learn the basics of squid fishing on a party boat from expert angler Tom Wood and then learn the technique of fishing with tube and worm from fishing author and guide Charley Soares on April 24, 7:00 p.m. at the West Warwick Elks Lodge, 60 Clyde Street, West Warwick. “The Rhode Island Saltwater Anglers Association meeting will focus on when to fish deep vs near the top for squid as well as the best squid lures and gear to use.” said Tom Wood. Charles Soares said, “The uniqueness of the tube and worm is that it catches numerous species along with stripers from five to fifty ponds.” Non-members welcome with a $10 donation to the RISAA Scholarship Fund, members attend free. Visit www.risaa.org for details. Freshwater fishing continues to be very strong. “A customer caught a 3.5 pound largemouth bass at Brickyard Pond in Barrington this week.” said John Littlefield of Archie’s Bait & Tackle, Riverside. “Anglers are doing very well with largemouth bass, we sold a lot of shiners this weekend.” said Craig Mancini of Continental Bait & Tackle, Cranston. Mancini said, “Trout fishing has been better than it has been in a long time. Mike Cardinal of Cardinal Bait & Tackle, Westerly said, “Trout fishing at Carolina Trout Pond and Meadowbrook Pond (both in Richmond) has been great but the rivers have been a bit too high for anglers.” John Littlefield of Archie’s Bait & Tackle said, “Opening Day’s weather discouraged some anglers from fishing so Willet Avenue Pond, Riverside is still holding a lot of fish with anglers limiting out there." “Trout fishing is very good at Melville in Portsmouth. PowerBait is the bait of choice with spoons working good at Lincoln Woods for one customer.” said Manny Macedo of Lucky Bait & Tackle, Warren. Gil Bell of Charlestown caught a four pound, 25” chain pickerel at Watchaug Pond, Charlestown last week using a Sutton Frisby Spoon. Tautog fishing season opened up Saturday, April 15. Some anglers target them this weekend with poor results as it was quite windy this weekend. Mike Cardinal of Cardinal Bait & Tackle said, “We did not have many customers target tautog, things should get going later this week.” Many Macedo of Lucky Bait & Tackle, Warren said, “Customers targeted tautog at Stone Bridge, Wharf Tavern and other places but did not get a bite.” Fishing further up the Bay was not good either, John Littlefield of Archie’s Bait & Tackle said, “A customer fished the Nayatt Point area for tautog but the wind picked up and he came back, he had a cold of good bites but no fish. Others targeted Wharf Tavern, Jamestown and Newport but we haven’t back from them yet." Michael Laboissioniere of North Providence with a 2 pound trout he caught at Olney Pond, Lincoln. Alicia DeAngelis caught her limit of trout (five fish) in just a couple of hours at Silver Spring Lake, North Kingstown. “She used PowerBait fished on size 14 snelled treble hooks eighteen inches above a bass sinker.” said Dave Henault of Ocean State Tackle. 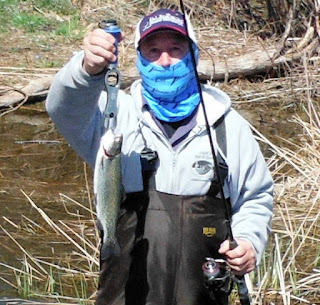 Rich Andrews with a 27”, three pound trout he caught opening day. Trout seemed larger this year. The RI Party & Charter Boat Association donated cash and canned goods to the Johnnycake Center food bank as part of their annual meeting Sunday at Spain’s Restaurant, Narragansett. In photo: Captains John Rainone, past board president; Steve Anderson, vice president; Andy Dangelo, treasure; Paul Johnson, secretary and Rick Bellavance, president. 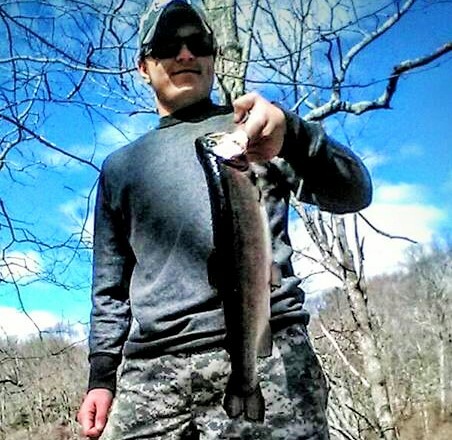 Late start OK: John Soloyna of Warwick caught this rainbow and brown trout within an hour after he started to fish around noon Saturday. It’s spring and the fishing is great. 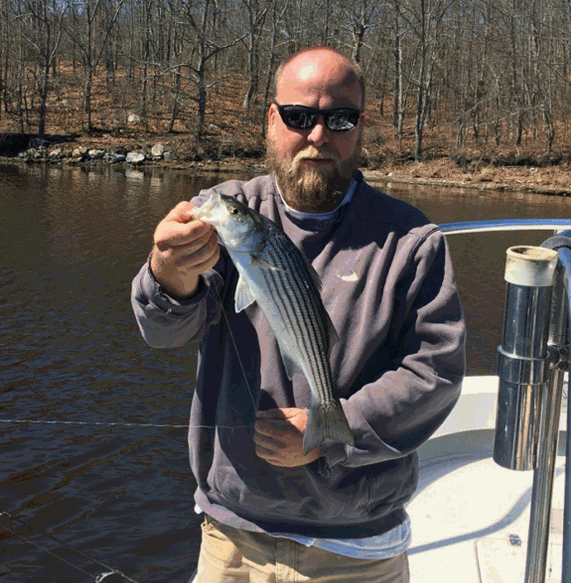 Opening day of the freshwater fishing season was a big hit, tautog season opens Saturday, April 15 and anglers are catching school striped bass in southern Rhode Island saltwater ponds, coves and rivers. Tautog fishing is fun. 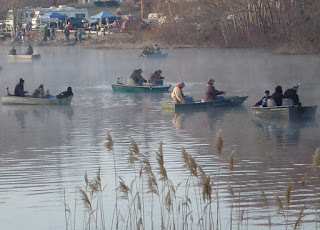 I like to relax with friends and family, shoot the breeze and enjoy a great Rhode Island fishery all at the same time. Tautog (or Blackfish) is a great eating fish too with a dense whitish meat. The Rhode Island Department of Environmental Management (DEM) regulates tautog fishing with three seasons. The spring tautog season opens Saturday, April 15 and ends May 31 with a three fish/person/day limit; fishing reopens August 1 to October 14 with a three fish/person/day limit; and then the late fall/winter season runs from October 15 to December 15 with a six fish/person/day limit. A fishery-wide closure, to protect tautog during their spawning period, is in effect from June 1 to July 31. At all times when the fishery is open, there is a limit of 10 fish/vessel daily limit. Party and charter boats are not subject to the 10 fish/vessel limit. You have to be over or near structure (rocks, piers, wrecks, ledge, humps or holes, etc.) to catch tautog so anglers use a number of strategies to ensure their vessel stays in position. The trick is positioning the vessel without getting your anchor stuck in rock. I’ve lost three anchors over the years which can cost as much as $300 to $500 depending on the type of anchor and chain. Anglers often use a grappling hook anchor make of rebar to tautog fish. The soft rods allow the anchor to bend if it should get caught in structure. Capt. Sherriff said, “Another method used by anglers is to tie a line to the end of their Danforth or grappling hook anchor (opposite the chain end) and attach a float to the other end of the line”. When ready to leave they pick up the float and line which pulls the anchor out of the structure the same way it went in. I use an anchor retrieval system (www.westmarine.com ) which cost about $100. A float on a six foot line is attached to your anchor line with a sliding metal ring. When the vessel is pulled forward toward and beyond the anchor the ring eventually works its way down to the anchor and the float brings the anchor to the surface where you can retrieve it off the stern. The trick is not getting the anchor line caught in your prop as you move forward toward and beyond the anchor. Another method that worked well for me when I had a smaller center console was the use of a cinder block as an anchor. The cinder block costs about $1.50. However, it often does not hold in strong current or seas and does not work well with large or heavy vessels. Anchoring over structure takes some practice too. Locate a rock pile with electronics, estimate wind/drift direction and anchor up current from where you want to fish and drift back to the spot as the anchor is setting. Once in position, fish all sides of the boat casting a bit to cover as much area as you can. If still no bites, let some anchor line out a couple of times to change your position, if still no bites it is time to move the vessel. Watch for more tautog fishing tips next week. Visit www.dem.ri.gov for licensing information and locations, a list of waterways that have been stocked with trout and details on regulations. On-the-Water magazine’s striped bass migration tracker (www.onthewater.com/striper-migration-map) shows school striped bass are working their way north up the Connecticut coastline with keeper fish being caught off New York. Jason Howell of Narragansett fished the Narrow River in Narragansett this weekend and landed school striped bass. The Rhody Fly Rodders will hold their Annual Cookout Get-Together Tuesday, April 18th, 6;00 p.m. at the Riverside Sportsmen’s Association, 19 Mohawk Drive, East Providence. Meeting will include fly casting as well as the continuation of the striped bass movie ‘Running the Coast’ that was first shown last month. Flies will be on sale with money donated to 'Project Healing Waters’. Contact Peter Nilsen, president, with questions at pdfish@fullchannel.net . Striped bass. School striped bass ae being caught in southern coastal ponds and rivers like Narrow River, Narragansett. However, it is early and hard to tell if these are migrating fish or hold-over fish from the winter. Tautog season opens April 15 (see above article). Freshwater fishing has been focused on trout and opening day (see above story). However, early signs are that the largemouth bite is good and picking up too. 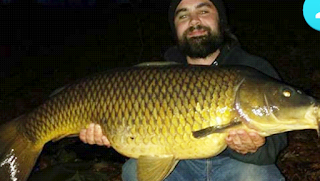 Jacob Ayotte landed this 26 pound carp and then a 23.9 pound carp last Sunday night using a pineapple soluble bait. Silver Spring Lake in South County is a favorite spot for families fishing on Opening Day. 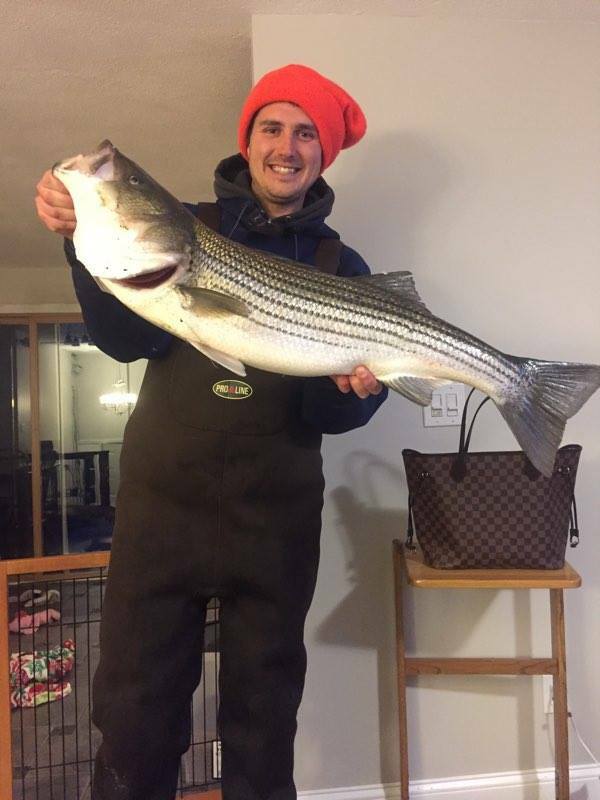 This 16 pound striped bass was caught by Capt. Rob Taylor's friend Matt (show in picture) just south for the Hurricane Barrier in the Providence River Basin. "The herring were on the surface and the hold-over bass were feeding on them. ", said Dave Henault of Ocean State Tackle. Opening day of the freshwater fishing and trout season is Saturday, April 8th. The Rhode Island Department of Environmental Management (DEM) plans to stock 80,000 trout into 100 Rhode Island waterways. New this year, Carbuncle Pond in Coventry will be stocked with brown and rainbow trout. Lake Tiogue in Coventry will not be stocked this year due to low water issues, and St. Mary’s Pond in Portsmouth will not be stocked. Beginning next fall and into the future, large brown trout will be stocked at Carbuncle Pond in Coventry with the goal of developing this location into a brown trout angling destination. On Saturday, April 8, a children’s fishing derby will be held at Pondarosa Park Pond in Little Compton. 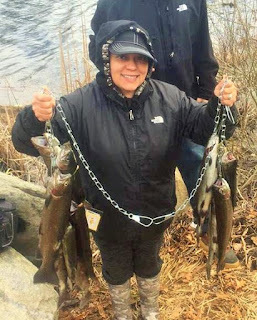 And on Saturday and Sunday, April 8 and April 9, fishing in Cass Pond in Woonsocket, Slater Park Pond in Pawtucket, and Ponderosa Park Pond in Little Compton will be reserved for children 14 years and under. A current fishing license and a Trout Conservation Stamp are required to keep or possess a trout or to fish in a catch-and-release or 'fly-fishing only' area. The daily creel and possession limit for trout is five from April 8, 2017 through November 30, 2017, and two from December 1, 2017 through February 28, 2018. Visit www.dem.ri.gov for licensing information, a list of waterways that will be stocked and regulations. “What we look for from shore are edges. What I mean by edges is the change between hi and low water, shadow lines of docks (and bridges) at night, edges of sand bars and banks, and edges of moving and standing water” said Peter Jenkins at the Rhode Island Saltwater Anglers Association meeting to a group of about 180 anglers at the West Warwick Elks Lodge. Most gamefish, like striped bass for example, set themselves up on edges or near edges to ambush and take advantage of prey (bait) that may be feeding or may be getting tossed or pushed along by moving water, currant and tide. “You can learn a lot from the birds… like what type of bait might be in the water that the fish are feeding on. If they are seagulls they can eat large baits, like herring and Atlantic menhaden, if small birds are on bait, such as terns you know they are after smaller bait possibly Bay anchovies as they could not lift large baits. Knowing what bait is in the water helps you target fish with the correct lure." said Jenkins. Another key tip is to remember that hard structure such as cliffs, rock formations and boulder fields hold bait such as cunner (choggies), black fish (tautog) and scup in the structure at both high and low tides. So these areas can be fished anytime. One last tip suggested by Jenkins and Aubut is check out the location you plan to fish during a moon low tide so you can see the contour, where the edges, pools and sand bars are located. “I surf and fish from shore but I got a whole different perspective of what was really under the water where I fish by putting a mask, snorkel and fins on and taking a dip to see what the bottom was like where I fish. I quickly learned why this particular stop usually held fish. The bottom was loaded with an active mussel bed that smaller fish and striped bass would feed on.” said Capt. Aubut. Visit www.saltwateredge.com and www.aubutrods.com for additional information and fishing tips. Hinckley Yachts of Portsmouth, RI introduced there first Certified Pre-Owned Program last week at an owners rendezvous in Key Largo, Florida. I always stop by the Hinckleys at boat shows as they are the gold standard of luxury yachts. The new program offers buyers of previously owned Hinckley Yachts a Certified Pre-Owned (CPO) program that includes extended warranties and the assurance that their purchase bas been factory maintained. Peter O’Connell, Hinckley CEO said, "Many Hinckleys that reach the used boat market have not only been built by Hinckley, but they have been maintained throughout their life by our own staff. We know these boats, we know that they've been properly serviced, we represent them in the marketplace, so our confidence in them is very high." To qualify for CPO status a Hinckley must have been serviced in the company’s seven service operations, or in a yard authorized to service Hinckley products. Boats then undergo inspection and must be listed for sale with a Hinckley-owned sales office. There is no program cost to the sellers or buyers. The first pre-owned Hinckleys are expected to be available this month. For information visit www.hinckleyyachts.com. Cod fishing. Make sure vessels are fishing the day you want to go. Dianne Valerien of the Seven B’s party boat said, “Cod fishing this week as been spotty.” Party boats sailing for cod fish at this time include the Frances Fleet at www.francesfleet.com , the Seven B’s (with Capt. Andy Dangelo at the helm) at www.sevenbs.com, and the Island Current at www.islandcurrent.com . President Trump’s 2018 proposed budget cuts for climate change initiatives has the scientific community alarmed and will harm the fish and the fishing community here in Rhode Island. “It includes scaling back the Department of Energy’s efforts to accelerate low-carbon energy. It also includes cuts to NASA’s Earth-monitoring programs. The proposal would also eliminate the Sea Grant program at NOAA, which helps coastal communities adapt to a warmer world.” said Plumer. The President’s budget outline mainly offers top-line budget parameters for agencies with little detail. A detailed budget will be offered by the White House in May on how it would like to fund and/or cut programs. The Congress then votes on proposals approving or rejecting them. All of this is very concerning as fisheries management relies heavily on science and research for data collection, understanding the impact of climate change on fish and ecosystems and much more. In recent years we have had warm water fish such as black sea bass and summer flounder move up the east coast, and we have seen cold water fish such as cod and haddock leave the area. This type of fish movement is important to study and it directly related to climate change, changing ecosystems and warming water. Here are some budget cut highlights that impact the fish, fishing communities, ecosystem-based management and climate change work. First NOAA’s Sea Grant program, used by 33 states to provide grants to help coastal communities deal with the challenges of climate change, would be eliminated. This is not a budget reduction but a federal budget elimination. “Including Sea Grant, Trump’s budget would eliminate $250 million in NOAA programs for coastal management,” said Plumer. In Rhode Island, like many other states, the Sea Grant Program is a federal-state-university partnership. The program, which is based at the University of Rhode Island was one of the first Sea Grant Programs in the country formed by legislation sponsored by Senator Claiborne Pell. Rhode Island Sea Grant designs and supports research, outreach and education programs that foster coastal and marine stewardship. For example, Rhode Island Sea Grant programs have helped to expand aquaculture in the state, mitigate beach erosion through use of offshore deposits, and address Rhode Island Marine Trades industry workforce skill gaps. Sea Grant studies have also explored the social impacts of ocean wind farms with the aim of encouraging ocean wind farm development on the east coast. For the next two years, Rhode Island Sea Grant planned to improve understanding of shellfish (bivalve and gastropod) stock assessments and population dynamics with a focus on resource management implications. Additional plans called for studying the impacts of climate change on finfish and shellfish population dynamics in Rhode Island waters, with emphasis on Narragansett Bay species and fisheries. In addition to eliminating the Sea Grant program and much of the funds going to CRMC, Trump’s budget includes a 31 percent cut to the EPA’s budget, from $8.2 billion to $5.7 billion. This includes zeroing out funds for many climate programs, including the agency’s work to monitor and reduce greenhouse gas emissions, as well as its Energy Star program, the voluntary program that helps companies produce energy efficient products. In the Department of Energy, Trump plans to impose a 17.9 percent cut, about $2 billion, from core energy and science programs intended to accelerate the transition to new (and cleaner) energy technologies. The Paris Agreement on climate change sets aside funding to help poor countries adapt to climate change and supports a host of other clean energy/climate change initiatives. As members of the fishing community, we need to help communicate these proposed cuts to others and share how they will impact the fish and fishing. We need research-based fisheries management programs that consider climate change and its impact on the fish and fish movement so we can grow fish populations to abundance. The Trump-proposed cuts to NOAA and climate change programs will greatly harm the long-term health of fisheries and fishing communities. The U. S. Fish and Wildlife Service, in partnership with RI Department of Environmental Management (DEM), announced its annual Cinder Worm Workshop. This is the program’s eighth year and it will include two weekday evening classes in fly tying instruction and one weekend evening of fly fishing. The program is free to registrants. The course syllabus includes practical rigging and fly casting instruction for the novice on the day of fishing. . “We would like to have everyone attend both workshops,” said David Pollack, one of the organizers of the program, “but you also have the option to pick just one.” Introduction to practical rigging and casting instruction will be covered for those that need additional assistance. Fly fishers will then fish the coves of Grassy Point area of Ninigret National Wildlife Refuge. All fly tying materials will be provided. Participants are encouraged to bring their own tools and equipment, but all necessary fly tying tools and equipment will be loaned to registrants upon request. Saltwater fly fishing equipment will be loaned to registrants. Kettle Pond Visitor Center, Charlestown, RI. The Fly Fishing portion of the program will take place Saturday, May 13th, 4:00 p.m. until dark at Ninigret National Wildlife Refuge, Charlestown, RI. Capt. Ray Stachelek and Dave Pollack, fly fishing experts and USFWS volunteers will facilitate the program. For information or to register contact Scott Travers at sott.travers@dem.ri.gov . The Narragansett Chapter of Trout Unlimited (TU225) will host its monthly membership meeting on Wednesday, March 29th, 6:30 PM at the Coventry / West Greenwich Elks Lodge, 42 Nooseneck Hill Road (Rte. 3, Exit 6 off of Rte. 95), West Greenwich, R.I.
For additional information contact chapter president Glenn Place at 1-401 225-7712 or TU225President@gmail.com . The Rhode Island Department of Environmental Management (DEM) will hold a series of free fly-tying workshops that began this week at public libraries in Middletown, Little Compton and Portsmouth. The classes, designed for beginning and intermediate fly-tiers ages 10 and older, will cover techniques for both freshwater and saltwater fishing and will culminate in fishing events to be scheduled this spring. Scheduled events include: Freshwater Fly-tying at the Middletown Public Library, 700 West Main Road, Middletown on March 20, 27 & April 3, 6:00 p.m. – 8:00 p.m. and at the Portsmouth Free Public Library, 2658 East Main Road, Portsmouth, March 23, 30 & April 6, 6:30 p.m. – 8:00 p.m. Saltwater Fly-tying will be held at the Brownell Library, 44 Commons, Little Compton, March 22, 29 & April 5 , 6:00 p.m. – 8:00 p.m. Classes are taught by experienced anglers from DEM’s Aquatic Resource Education program. All equipment and materials will be provided; however, participants are welcome to bring their own materials if desired. Space is limited and registration is required. To register, contact Scott Travers via email at Scott.travers@dem.ri.gov. 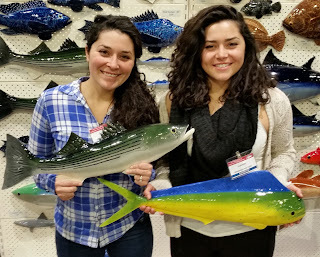 Grainger Pottery makes realistic ceramic fish: Caroline and Lauren Grainger of Grainger Pottery, East Sandwich, MA delighted attendees at the New England Saltwater Fishing Show. 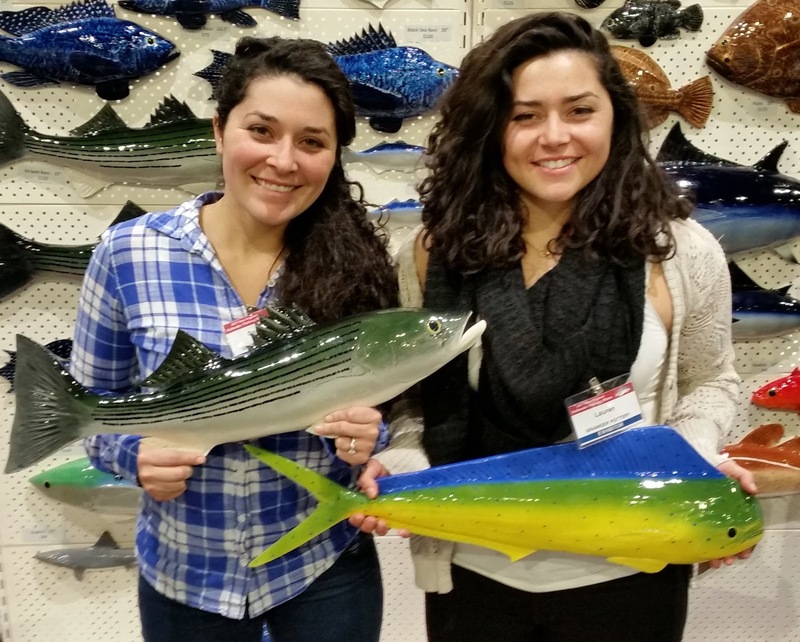 Their ceramic fish are made to size, molded from real fish from our area. The New England Saltwater Fishing Show was a big success this weekend. Steve Medeiros, president of the Rhode Island Saltwater Anglers Association (www.risaa.org) said, “We had a line of 600 people waiting to get in Friday that stretched from the ticket office at the Convention Center all the way to the hotel.” And, on Sunday morning at 11:00 a.m. (an hour after the show started) the line I saw had about 400 people in it. Medeiros said, “We sold out booth space (over 300 exhibitors) a month before the show and we won’t know formal attendance numbers until we get a report from the Convention Center but it is sure to be record breaking.” More than 15,000 people have attended the show in the past. Here are a few exhibits that caught my attention at the show. Matt Bosgraaf, manager of The Kayak Centre of Rhode Island, Wickford, RI said, “After taking a few years off we returned to the show and are glad we did.” Half way through the show on Saturday the Kayak Centre had already sold four boats. “And, you never know who is going to walk through the door in the next month or two and say ‘Hey we saw you at the Fishing Show and want to buy a Kayak’. That’s the way it works.” said Bosgraaf. Kayaks and paddle boards are one the fastest growing segments of boating with peddle kayaks being the craze and boats being tripped-out with fish finders, electric motors and much more. Sunday Kayak Centre owner Jeff Shapiro said, “To gain more awareness and walk in traffic the Kayak center plans to open at a new location this summer in the old Ryan’s Market on Brown Street in Wickford.” The Centre still plans to launch boats on Wickford Cove but the new location should generate additional exposure (they also have a summer location in Charlestown, RI). The Centre offers kayak lessons, paddle board and kayak boat rentals and sales with such brands as Feel Free, Old Town, Wilderness and Native Watercraft. They also sell gear and wear for kayakers including lines such as Patagonia and offer fishing seminars and events through their partner Ocean State Kayak Fishing. Visit the Kayak Center at www.kayakcentre.com . Bill Hurley Lures are custom made with lots of sand eel oil. “Traffic at the show has been great. I almost wish we sold the lures at the booth but we distribute them through bait & tackle shops such as Goose Hummock Shop, Fisherman’s Line and Falmouth Bait & Tackle who are at the show. The soft plastic lures are designed to mimic sand eels and are made with pure sand eel oil that is injected into the plastic and then the inside of the bag and lure are coated with sand eel oil when packaged.” Adults and children attending the show were mesmerized by Bill’s fish tank display of the lures working in the tank under simulated current conditions. The lures danced in the tank as water and pushed past them. The lure features Mustad jig hooks that are guaranteed not to fail when fishing for striped bass. Hurley Lures’ new lure called a Canal Deep Water swim bait is designed to mimic a herring, Atlantic menhaden and/or a sand eel. It will soon be available in 6, 5 or 3.6 once sizes. Visit www.codandstriperlures.com . Cheeky makes both fly fishing and spinning reels in bright green and blue colors. This Arlington, MA Company has been designing and building reels for six years and were one of the first manufactures to use bright colors to construct reels. Ted Upton, CEO of Cheeky said, “Our multi-disc drag system is one of the most distinguishing features of our spinning reels. Our SaltForce aluminum frame and body and machined carbon spin spool keeps the reels strong and light weight.” The CYDRO line was on sale at the show for $100 (normally $129). It is available in 3500, 4500 and 5500 model sizes all at the same price. Upton said, “We are happy at how the reels did at the show and what was surprising was that we had just as much interest in our fly fishing reels as we had with our spinning reels.” Visit www.cheekyfishing.com . The advantage of collecting accurate data is that fishery biomass, catch and effort are more accurately estimated. If we have better data fisheries are managed more effectively so we can grow them to abundance so there are more fish for all to catch. The company’s FishNET software is its first application to collect real time catch, effort and biological data electronically. Today the software is accepted by NOAA in select areas as the software of choice to speak directly to the ACCSP data warehouse offering commercial fisherman and charter boats the opportunity to file their Vessel Trip Reports (VTRs) electronically saving hours of paperwork and providing fish mangers with more accurate data. Visit www.harborlightsoftware.com . Dave Morton of Beavertail Rod & Reel said, “We are now getting into repairing kayak peddle systems too.” The North Kingstown company does reel cleaning as well as rod and reel repair. They take apart reels, clean all pierces and then reassemble the reels. Morton said, “We can modify and customize reels for anglers of all types including people with disabilities enabling them to fish or fish more effectively.” The company replaces guides and tips on reels too and can be found at www.beavertailrodandreel.com .